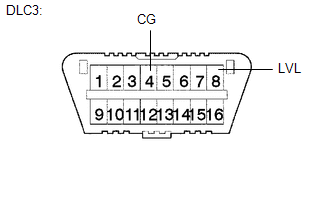 Initialize the headlight leveling ECU assembly (set the zero point of the height control sensor in the headlight leveling ECU assembly) after the vehicle height changes due to replacement of the suspension or after performing such operations as removal and reinstallation or replacement of the rear height control sensor sub-assembly RH. Adjust the headlight aim after initializing the headlight leveling ECU assembly (See page ). When a malfunction is detected in the automatic headlight beam level control system, height control sensor signal initialization is impossible. Perform troubleshooting before initialization. (a) Unload the vehicle and its trunk, ensuring that the spare tire, tools and jack are in their original positions. (b) Check that there are no passengers in the vehicle. (c) Turn off the headlights. (d) Stop the vehicle on a level surface and keep the vehicle height unchanged. (a) Turn the ignition switch to ON, and check the indicator light. The headlight leveling ECU assembly is replaced with a new one. Indicator light continuously blinks 6 times at 2 Hz. Removal and reinstallation of the headlight leveling ECU assembly, replacement of the rear height control sensor sub-assembly RH, removal and reinstallation of the rear height control sensor sub-assembly RH, replacement of the suspension, etc. is performed. Indicator light comes on for approximately 3 seconds, and then goes off (bulb check function). If the indicator light does not come on when turning the ignition switch to ON, inspect and repair it according to Problem Symptoms Table (See page ). (a) Connect terminals 4 (CG) and 8 (LVL) of the DLC3 using SST. (b) Turn the low beam headlights on and off using the light control switch within 20 seconds after connecting the terminals. The number of times the low beam headlights need to be turned on and off is determined by the present fuel level as shown below. Fuel level is within A range. 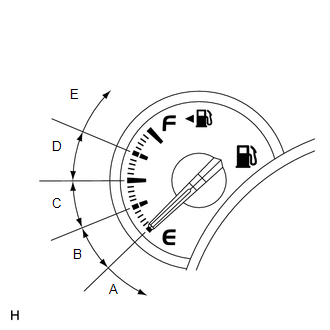 Fuel level is within B range. Fuel level is within C range. Fuel level is within D range. Fuel level is within E range. Turn the low beam headlights on and off at approximately 1-second intervals. Be sure to operate the light control switch from outside the vehicle. (c) Check the indicator light. Blinks 6 times at 2 Hz → Continuously blinks N*1 times at 2 Hz. Off → Continuously blinks N*1 times at 2 Hz. *1: The number of times that the indicator blinks is determined by the number of times the low beam headlights are turned on and off. If initialization cannot be finished normally, disconnect SST from the DLC3 and turn the ignition switch off. Then, restart from procedure 1.